Tax Breaks, Falling Costs Are Boosting Wind And Solar Congress has extended tax credits for clean energy as part of a $1.8 trillion spending bill. Solar and wind power companies say it will catapult the industry at a time when costs are already falling. Right before the holidays, Congress approved tax credits for clean energy. It was just a tiny part of a $1.8 trillion spending bill, but solar and wind power companies say it's a Christmas present that will catapult their industry forward. 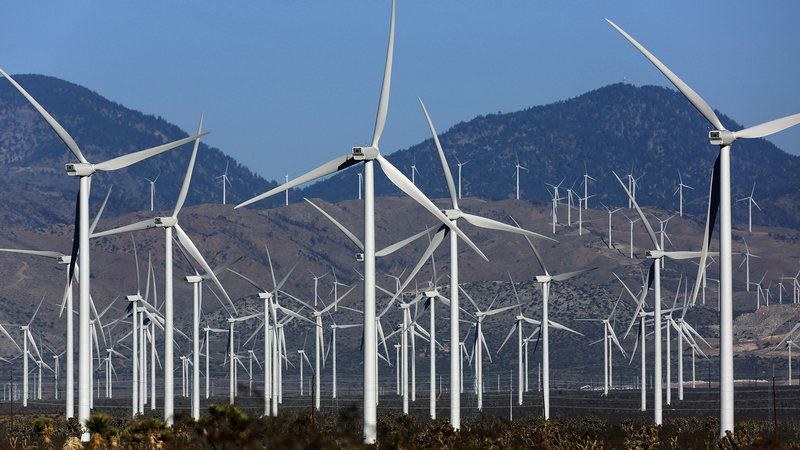 Analysts are predicting a big boost in wind and solar projects over the next few years. Thanks to fracking, solar and wind power now have to compete with supercheap natural gas. So more than ever, if you run a solar or wind farm you want to squeeze every bit of power and efficiency you can out of it. 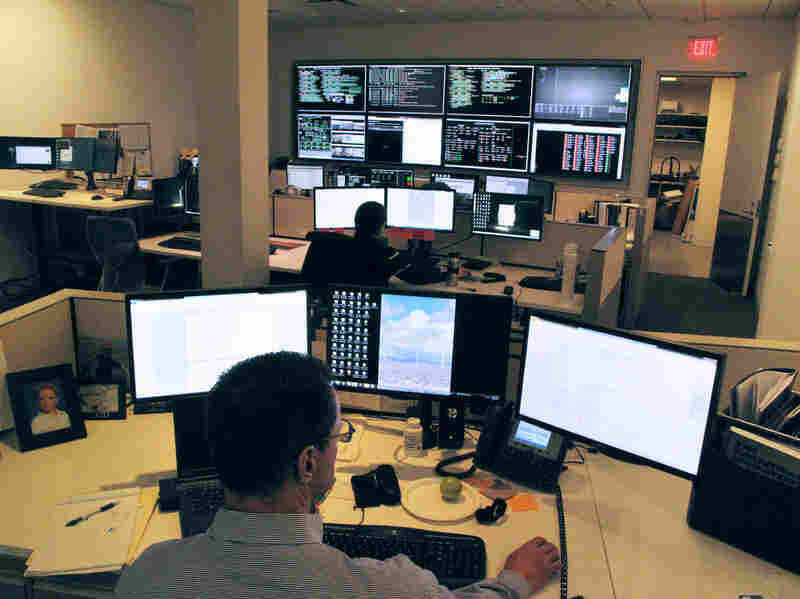 And you can see that at SunEdison's national control center in Boston. Megan Rodgers is working at a bank of big wall-size digital displays. She is tracking the solar arrays and wind farms that the company builds and operates in Texas, Hawaii, Maine and 20 other states. Rodgers is on the phone with technicians out in a field of spinning wind turbines in Utah. They're doing some upgrades. But Rodgers notices that some of the turbines have gone dark on her display and may have stopped spinning. "There's a whole string of them that are out," she says. Within minutes she has sorted out the problem. Wind Power Continues Steady Growth Across The U.S.
"This is a really big deal," he says. "I mean it is probably the biggest thing that's happened to the renewable energy business over the last decade or so." Kearns says that's because tax credits are still crucial to securing financing for big solar and wind installations. And in recent years Congress created too much uncertainty, he says. But now, Congress has extended the tax credits for five years. It's an important moment for the industry for another reason, too: cost. "What we've seen that's so interesting is the very remarkable decline in the costs of utility-scale wind and utility-scale solar," says Jonathan Mir, head of power and utility research for Lazard, a big financial firm. Mir says in 2009 the cost of wind power in North America on an unsubsidized basis was $135 per megawatt-hour. Today, he says, "the best-in-class unsubsidized wind can be built at prices of $30, so you've seen cost come down by 60-70 percent in the last five to seven years on utility-scale wind." Solar has fallen in price even more sharply. And Mir says in just the past two years there's been a big shift in the industry. He says utilities now want to add more wind because that power can be cheaper than even upgrading an old coal plant to meet pollution standards. "That's an amazing, amazing inflection point," he says. "Renewables have reached a point where there's no going backwards," he says. "They are becoming cheaper and cheaper and will eventually become the cheapest resource that we can use." But Binz says renewables still face a key problem. They're intermittent: The sun goes down and the wind stops blowing. So one big area of research is energy storage to help get around that problem. In the meantime, Binz says, solar and wind will be ever-larger puzzle pieces to complement natural gas power plants and other sources of electricity generation in the U.S.